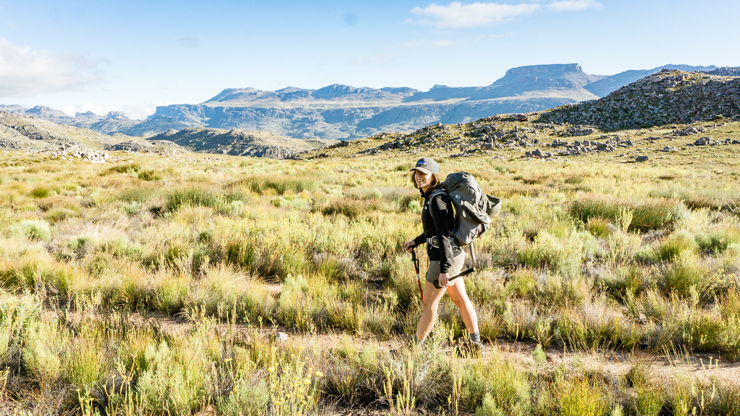 Looking for a multi-day hike in a remote, secluded and unspoilt part of the Western Cape in South Africa? 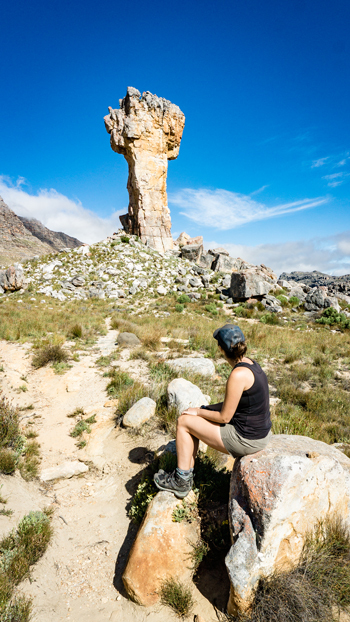 Then you should definitely consider Cederberg! 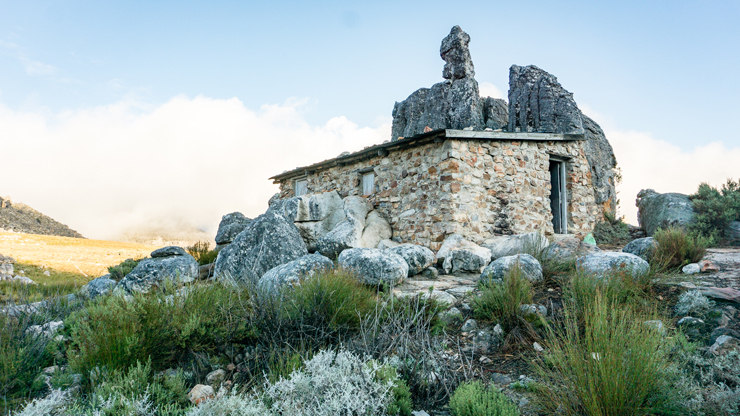 This nature reserve is located about 200 km north of Cape Town but offers a completely different experience. 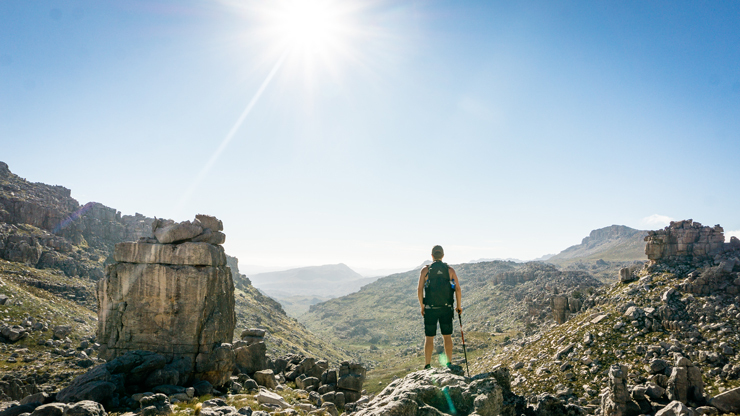 With 71,000 hectares of rugged mountain landscapes and rock formations, Cederberg Wilderness Area is a top spot for hikers and climbers. We mapped out a hiking trip of three days, without loading it too much. Well, to be correct: 2 nights and 2 days; the first and last day were also travel days, so only half-days of hiking. Anyway, we certainly wanted enough time to enjoy this beautiful piece of nature. 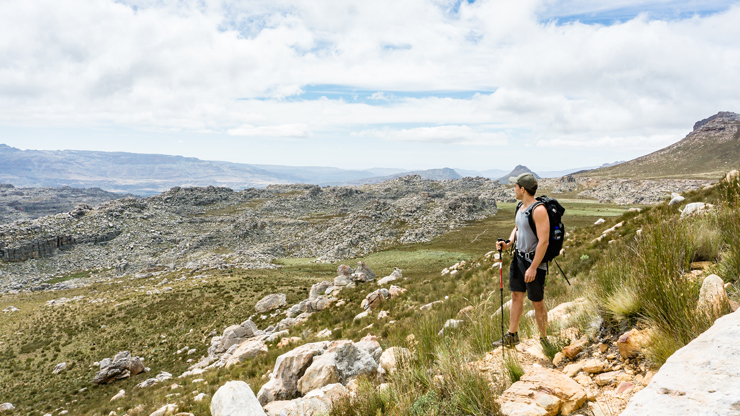 Of course, as true hiking enthusiasts, we included the highest peak of the reserve: Sneeuberg (2,027 m). 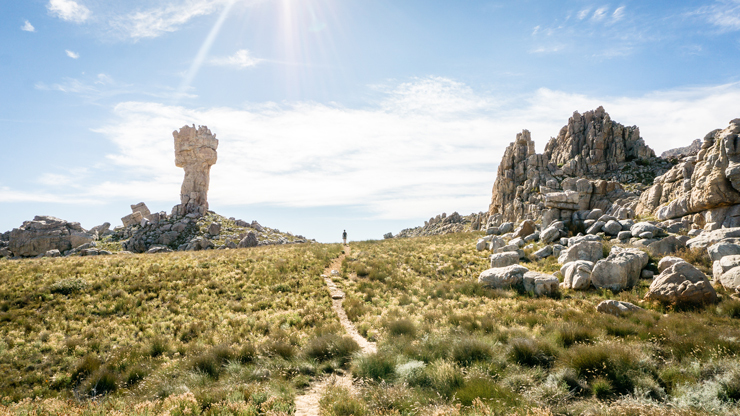 The climb of the Sneeuberg can perfectly be combined with the imposing Maltese Cross, one of the most bizarre sandstone formations that are so typical for Cederberg. And so this beautiful trip was a fact. 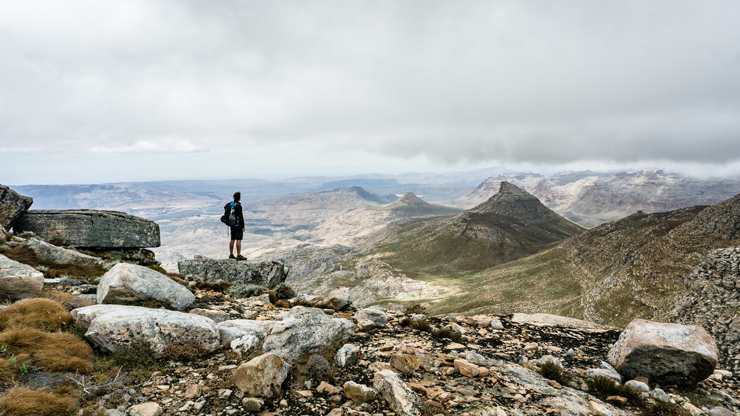 Driving northwards from Cape Town for about 3 hours, you’ll end up in a completely different landscape, dominated by mountains and rocks in all possible earthy colors. This all creates a warm atmosphere, regardless of the intense heat that can prevail. 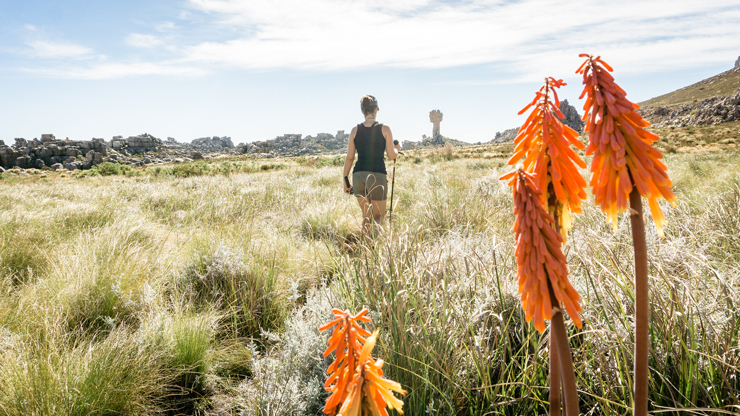 Welcome, this is the wilderness of Cederberg! 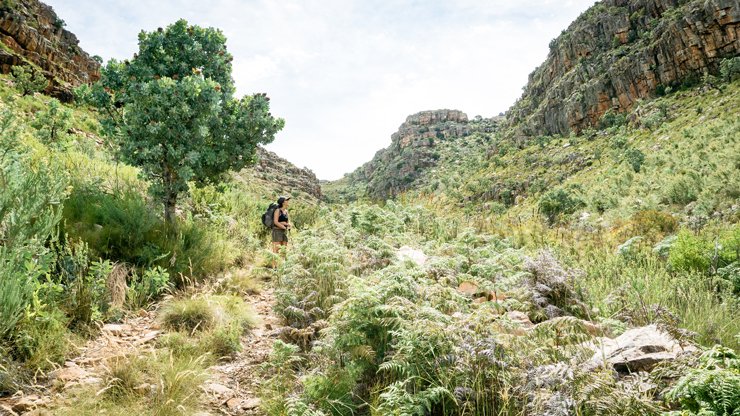 Before starting the hike, you can still do some shopping in one of the nearby towns: Clanwilliam or Citrusdal. Next, you have to register and purchase a permit. This is possible in the Algeria Campsite office. 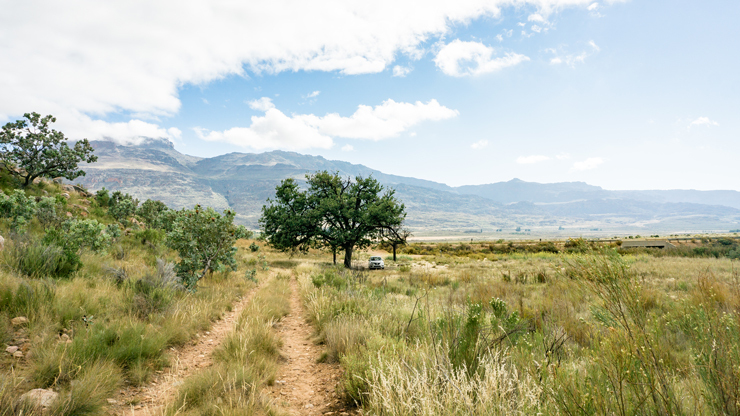 The road then turns into a dirt road, but quite doable for every type of car (much more pleasant than in Jonkershoek Nature Reserve!). 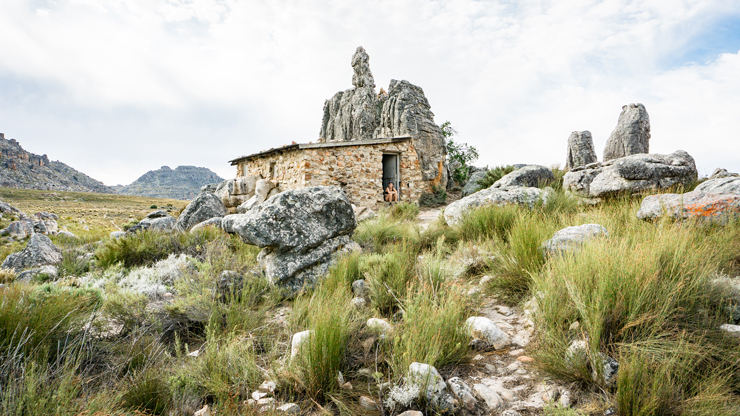 At the moment of writing, the conservation is 70 Rand per person (adult) per day and an extra 40 Rand per person overnight fee. For the current fees, we advise you to check the official website. You can leave your car at the Eikeboom (the Oak Tree). Locals speak about it as it is a parking lot, but you easily drive past it. It is no more than a big tree – yes, an oak tree – with some space around for at most a few cars. 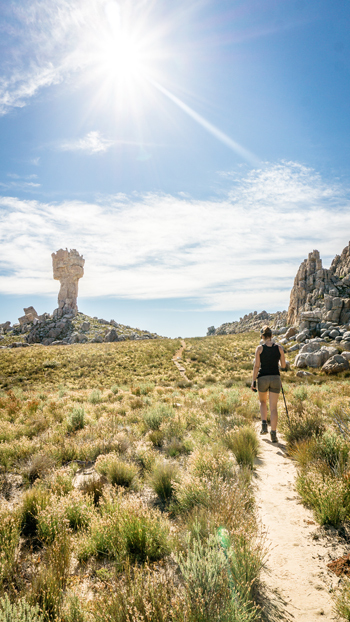 But, this is Cederberg: you’re more likely to be alone, than no longer finding a spot here. From Eikeboom the trip can truly start! 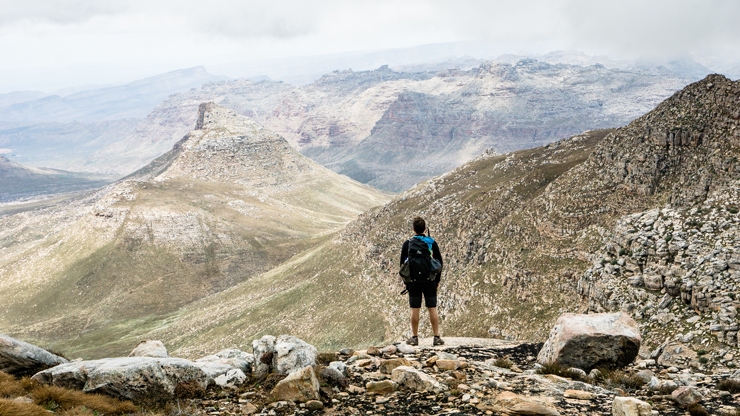 You immediately notice that this part of the Western Cape is indeed remote. The trail is overgrown, as if nobody has passed here for a long time. 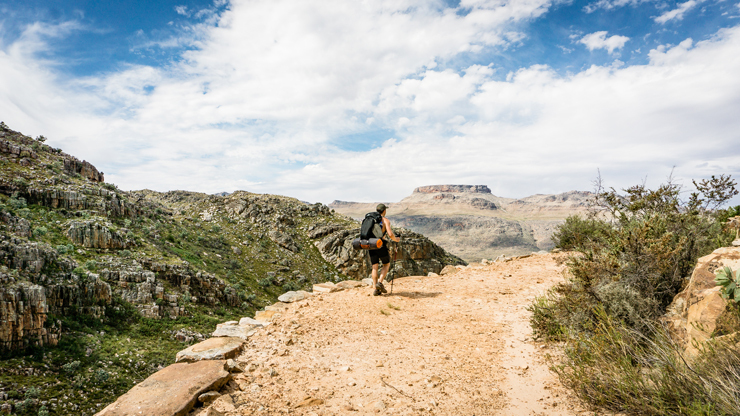 Nevertheless, the trail always remains sufficiently clear and easy to follow, so getting lost is not really a risk. 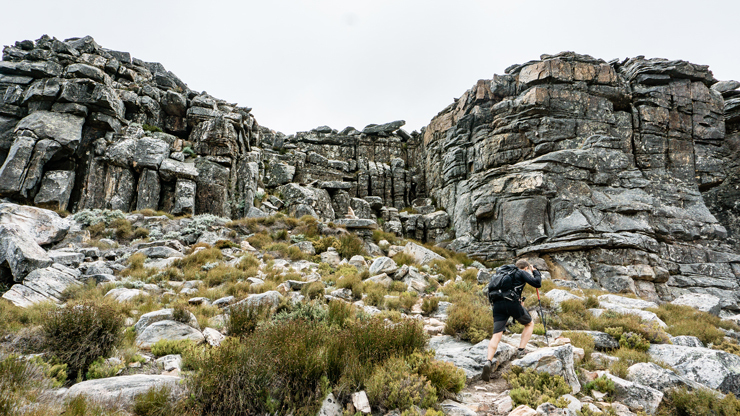 The first 2 km are easy, along a relatively flat path in a gorge. Thereafter the incline rises and climbing begins. 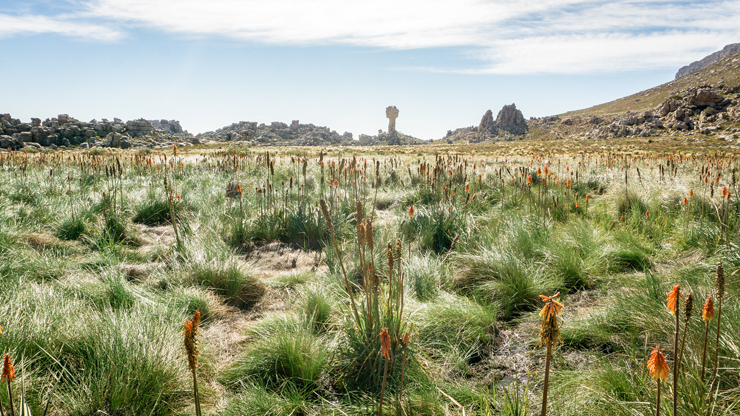 As you ascend, the vistas expand and also the astonishment by the vastness of this rugged nature reserve increases. 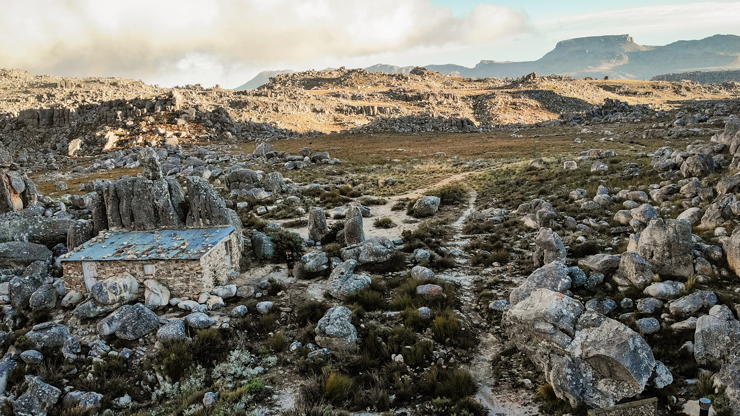 About 7.5 km and 420 vertical meters later, you arrive at the Sneeuberg Hut. 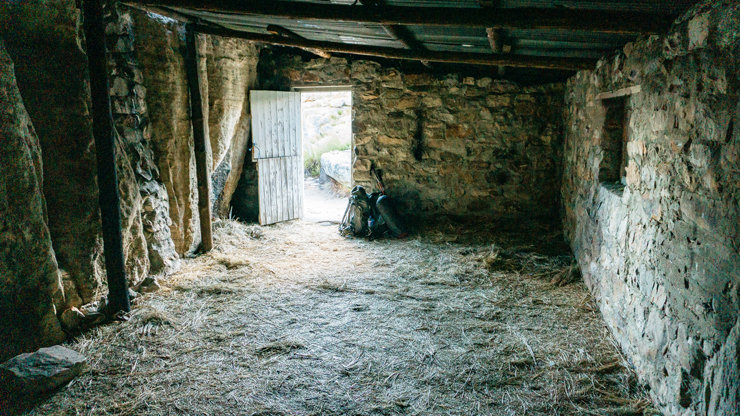 This idyllic hut, built against a gigantic boulder, is the perfect place to set up camp. In the past you had to reserve this cabin in advance, but that turned out to be unnecessary nowadays. Do not expect too much of it either. It actually just offers you shelter from the possible weather influences. But it does look charming and magical! 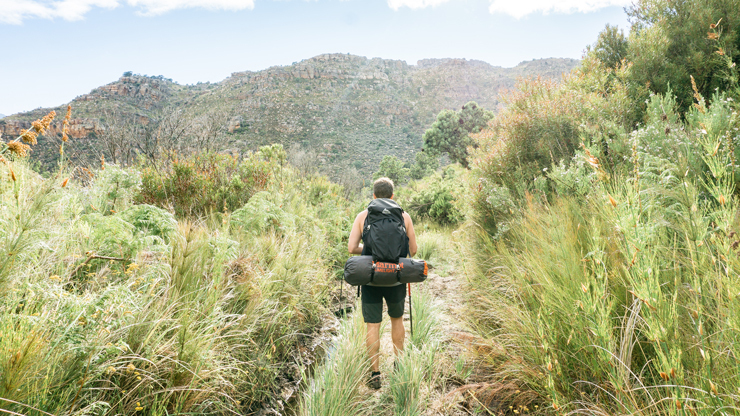 Yes, that fairy-tale feeling… It feels great to spend 3 days in the wilderness again! 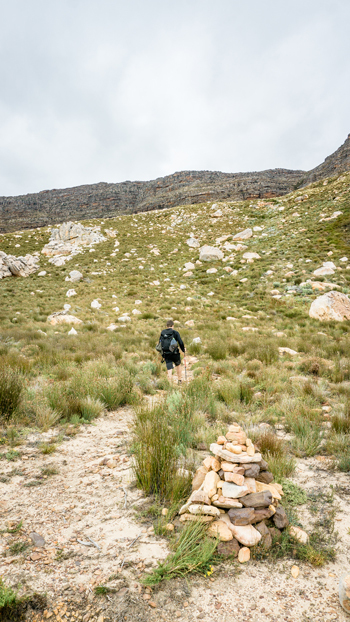 The next day we left for Maltese Cross, with no idea how big to expect that rock formation. 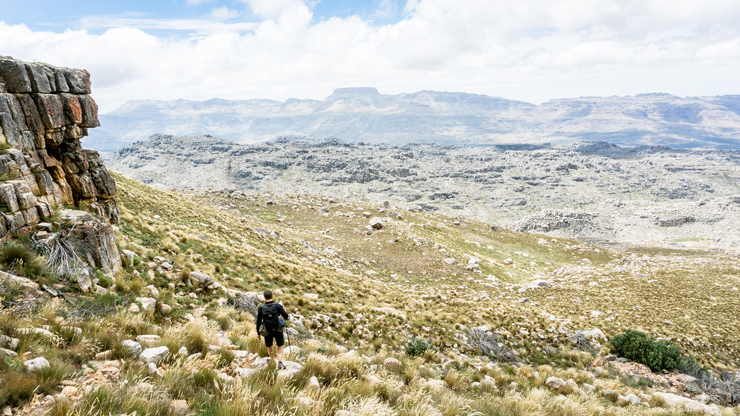 The hike to it is quite easy, without too much height differences, in a rough wild landscape. For the sake of completeness, we have looked it up: you have to ascend about 200 m over a small 5 km. The cross already comes into view from a long distance. It looks pretty nice, but at first glance not that extraordinarily huge. Oh, and watch out for wildlife on the way. 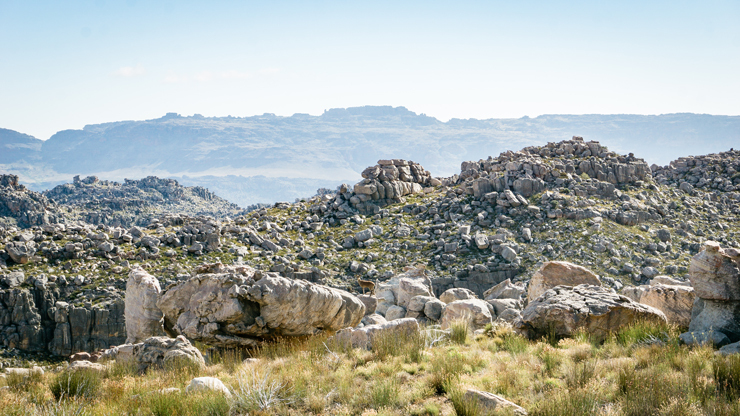 Can you spot the klipspringer on the third photo below? Needless to say, the closer you get, the bigger the Maltese Cross gets! Yes, it is quite impressive to stand in the shadow of this imposing creation. This is literally a sculpture of nature. With great admiration and respect we look up for minutes, from the base of this extraterrestrial artwork. Suddenly we feel so very small! It took a while before we could overcome that feeling. But we had to, because the Sneeuberg was staring! 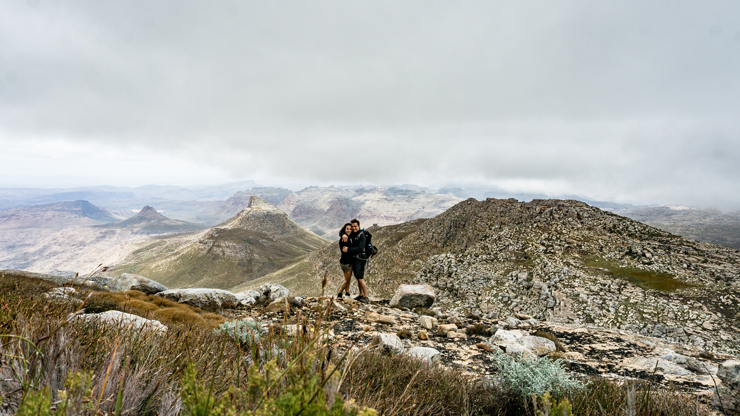 The highest peak of Cederberg dominates the entire environment. That is exactly what attracts us! 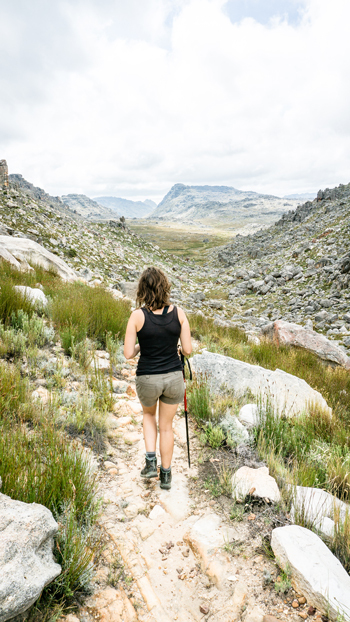 Halfway along the trail between the Maltese Cross and the Sneeuberg Hut you can start the climb to Sneeuberg westward. There are two paths that come together a little bit further. If you don’t pay attention, you easily walk past it. Watch out for the cairns (pile of stones) to find the way quickly. 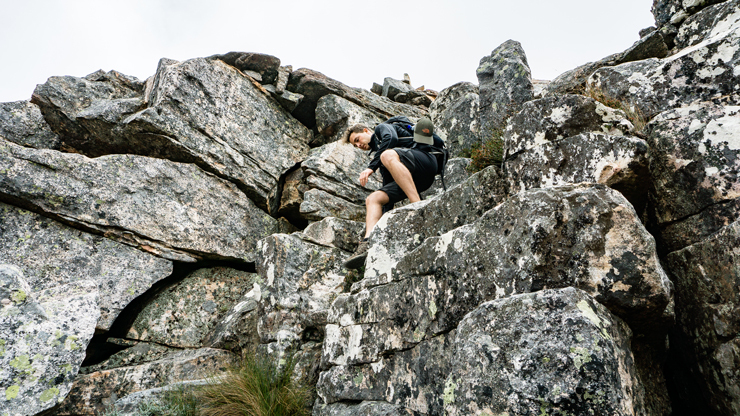 A steep, fairly direct climb of about 600 vertical meters awaits you. The last stretch is a little risky, since you really have to clamber. 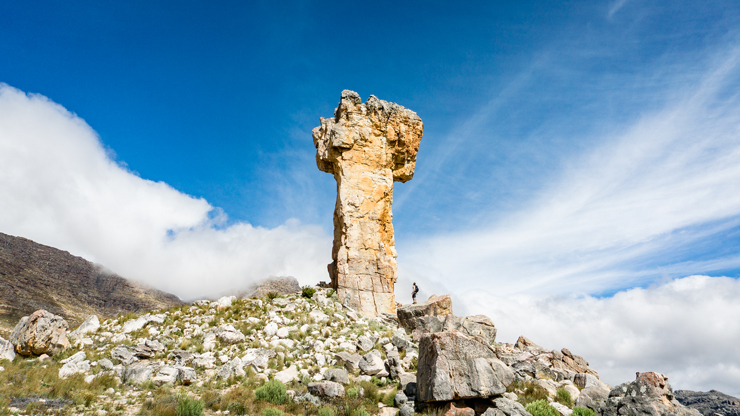 However, you are very close to the top, so stop your trip if it becomes too dangerous and enjoy the view. Look at how small that colossal Maltese Cross has become again! 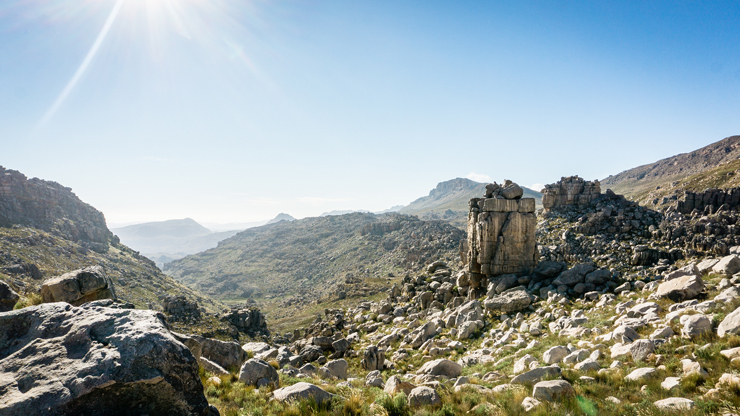 Table Mountain, the second highest mountain in Cederberg, makes the horizon just perfect! 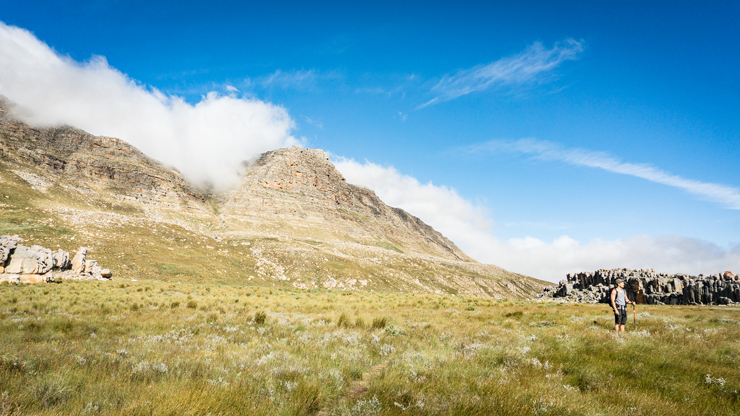 After a pleasant descend, we’re back at our home-away-from-home: the Sneeuberg Hut. 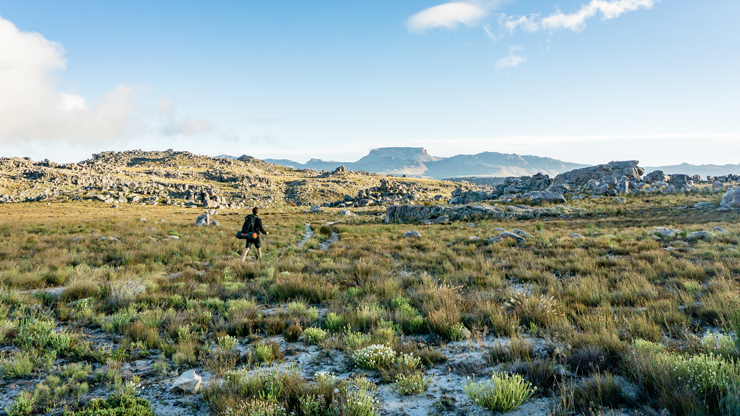 Enjoying our evening and morning in this amazing landscape, wondering if our next hike could beat this: the Panorama trail in Jonkershoek! 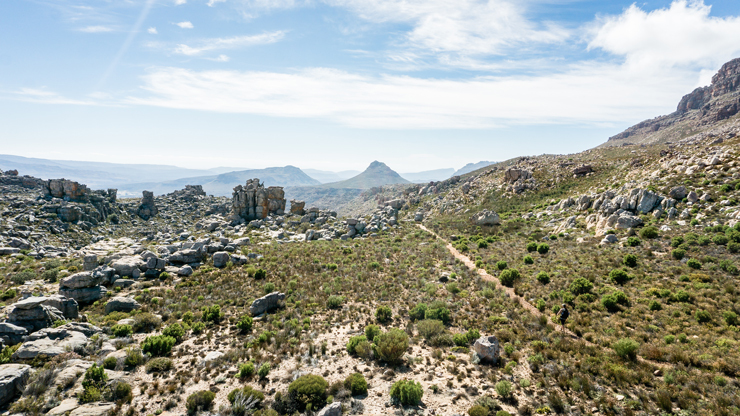 Although Cederberg is known for its hot dry summers, we had some bad luck with visibility. We had apparently just chosen that exceptional day with clouds and rain. Fortunately not the whole trip, though! Actually, the emerging clouds even created a mystical atmosphere. Without a doubt a successful 3-day trek!